The first time we went to Bangkok a few years ago, we didn’t quite love it as everyone said we would. We found it difficult maneuvering through the city, there was torrential rainfall, and it just seemed the stars were not aligned for us on that trip. But, a few years later, with a bit more planning, we’re in Bangkok for our second time and absolutely loving it! 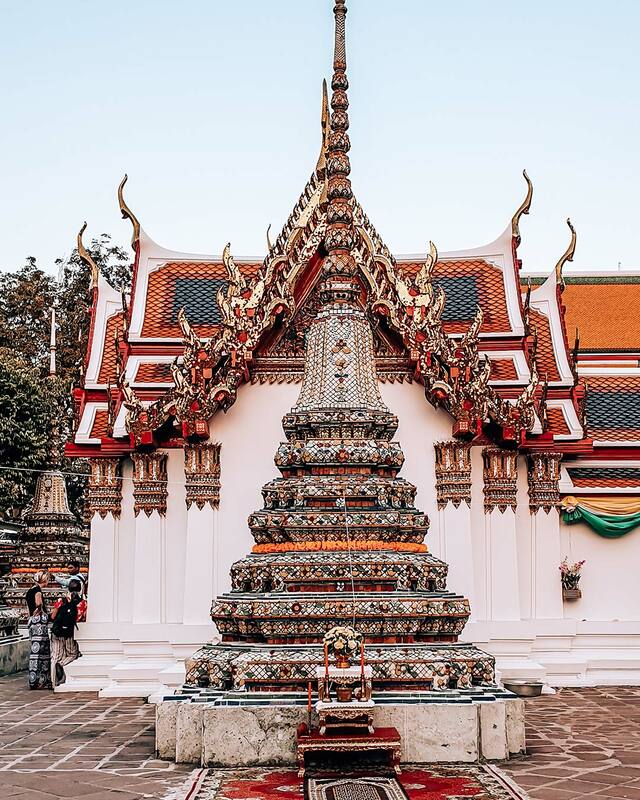 This inspired us to compile from all the things we researched and experiences from our first trip to give you our top 20 things we wish we knew before traveling to Bangkok! Here are our top 20 pieces of advice that we wish we got before our first trip to Bangkok! Check the weather and seasons before making plans to go to Bangkok. This is really a city where the rainy season means that it rains 24/7 for almost the whole time. And since it’s not the easiest city to get around, the rain makes it difficult to get a Grab/Car/Taxi/walk/etc. During our first trip to Bangkok, we went 2 weeks shy of dry season and it was a 5-day trip of getting drenched. 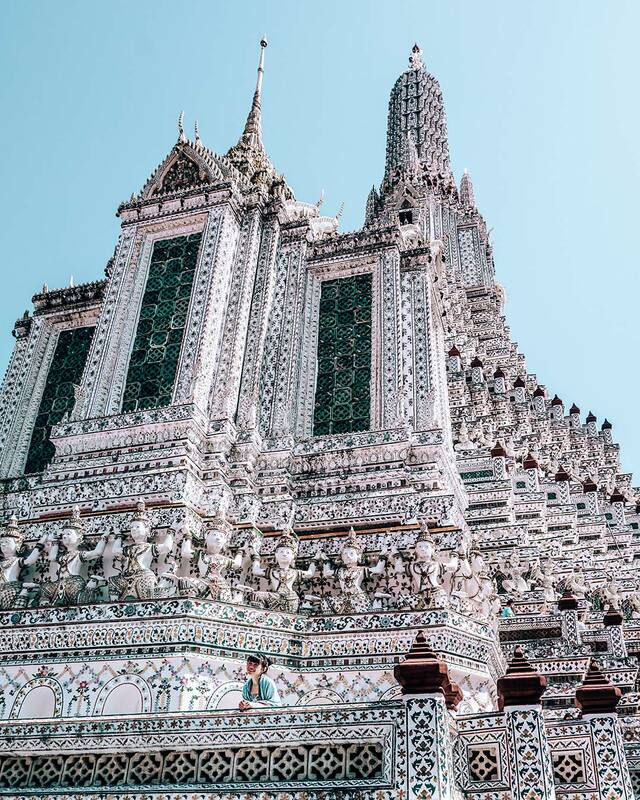 Tip: Best time to go to Bangkok is November – March where it’s not rainy and not too hot or humid. 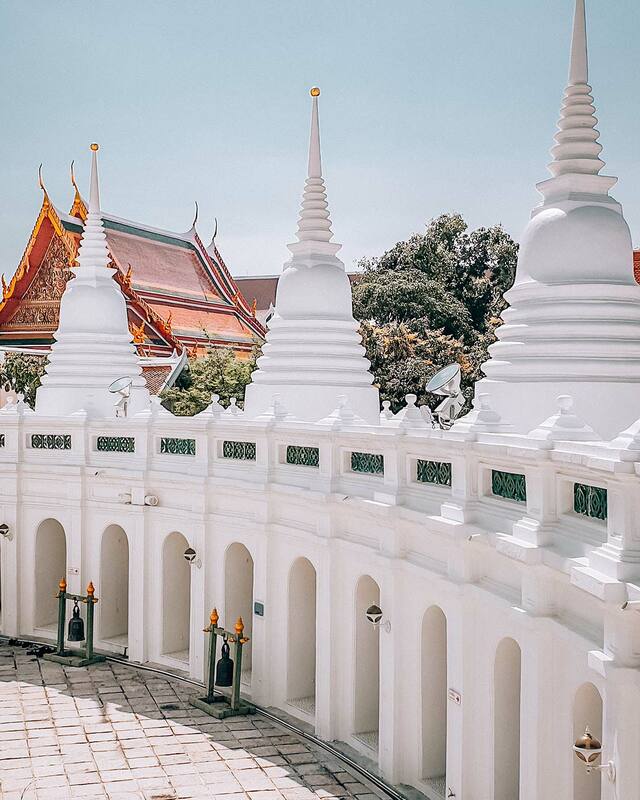 This is definitely one of the top things we wish we knew before visiting Bangkok. Many times, we like to just wing it. Explore the city and see what we feel like doing, armed with our rough bucket list scratched out on a napkin in hand. This method is not quite possible in Bangkok – especially if you want to get through your bucket list. How should you plan? Follow our next 5 tips. 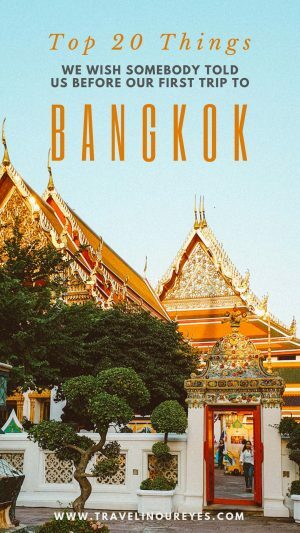 First thing, before you even book your hotel, is to plan what you (or group of you) want to see and do, and roughly where it is in Bangkok. We made the mistake of booking our hotel first during our first trip to Bangkok right in the city center. When we got in, we realized that many of the things we wanted to see and do were by the river and took over an hour to get to by car. Cluster the locations together and you’ll see there’s pretty much stuff on the river, in pocket districts, the town center, and stuff near the park. Other things, like the weekend market and floating market, are much further out. 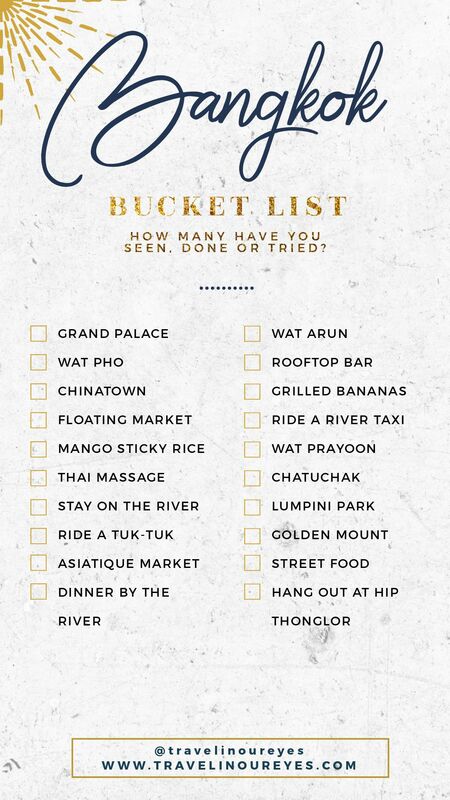 We have a Bangkok Bucket List here if you want something to start you off with! If it seems you’re there to see the Wat’s by the river, then book a place near the river. That way you can just hop on a river taxi to get you to the sights. If you’re traveling solo and would like to meet other travelers, then stay on Khao San Road. 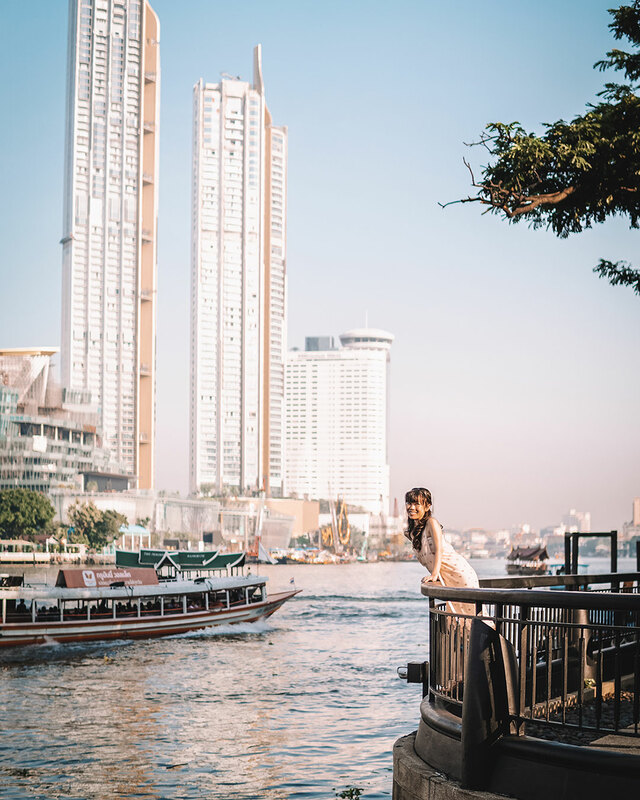 We wanted to see the Wat’s on the river, hang out at hip Thonglor and as well as explore the city center so we actually moved around and stayed at different hotels through our trip (See our guide on where to stay in Bangkok here). It seems troublesome, but we were so grateful the hotels were nearby when we just wanted to pop back indoors to escape the heat. You’ll be surprised to find 5-star hotels in Bangkok (and all of Thailand, if fact) for less than you expected. It’s worth looking at to see if it’s within your budget for a luxury stay! Rush hour traffic which usually starts in the morning from about 7am – 10 or 11am and evening 4pm – 8pm. Keeping this in mind will help to navigate to the different locations easily and stressfree. If all this planning seems tiring, just do the location planning and book your hotel based on the location. After that, know that if you want to go see any sights, the best time to go is first thing in the morning when it’s opening. A place like the Grand Palace will already have a queue even before the doors open. We’ll be coming out with a perfect, easy going 2-3 day Bangkok itinerary that you can download soon! Look out for it or subscribe to know when it comes out. And we mean the paper ones! We hadn’t used paper maps in a long time since everything is right there on your phone. But for some reason, having a paper Bangkok city map really helps especially with the super long Thai street names, winding river cutting right through the city and confusing small lanes. You can get good city maps at the hotel so be sure to ask them. And if possible, get it English and Thai so you can show it to the taxi driver if you need. The first thing to realize is that on a map, Bangkok looks like any city, not too big and a little scattered. But when you arrive, Bangkok will seem really huge! Things really are spread quite far apart. And that seems further when you add in the fact that it takes you about 30 minutes to any hour to get anywhere with the traffic. On top of that, the BTS and the MRT are rather short lines and each stop is quite far from the next. But if you understand the city layout and you’ve done your planning, it’s actually not so big. Just the traffic makes it seem big. Unfortunately, tourist scams are fairly common and definitely one of the things you must know when visiting Bangkok. The scams are generally harmless and will usually just cost you money (sometimes costing more money than others) rather than pose a threat to your personal safety. One of the most common tourist scams is the taxi/tuk tuk driver or stranger on the street tells you the Wat you want to visit is closed and offers to take you to another place instead. We read about this when planning our trip to Bangkok and the first taxi we got into gave us exactly that line. It was a good thing we were very sure of the Wat opening and closing times (though we must confess that we questioned whether we got the times correct) and insisted to go. And yes, it was open! Be sure to do your research, generally, know where places are and what time/day they open and close. It’s really just small things they try with tourists. It’s nothing that will cause you harm. The BTS and MRT run smoothly and beats the traffic, so it’s a great option for transportation. Just be aware that the train lines and stops are a little limited and aren’t always near the sights. But it’s a good option to get you closer. We didn’t realize how far each stop was from each other. That, with the intense sun (or torrential rain), makes it seem like a very far walk! Again, we talk quite a bit about public transportation in our blog ‘Bangkok Travel Guide for First-timers’ so hop on over if you want to know more about how to deal with taxis, negotiating tuk-tuk fares, water taxis and the like. What we wished we knew before visiting Bangkok was that GrabCar isn’t actually ‘legal’ in Bangkok. Since we’re not keen on negotiating fares and possibly miscommunicating where we want to go, went everywhere by Grab rather than Taxi. But because GrabCar isn’t fully legal, they won’t drop off or pick up where there may be police around. Places such as the Grand Palace, Wat Pho, Asiatique Market and the Airport. So even if GrabCar can drop you off around the corner from where the police are, you won’t get any to pick you up and are stuck with either getting a taxi that charges very high fare or walking to find a BTS or MRT station. Just needs a bit of planning and you’re all fine. If you’ve never been, definitely try taking a tuk-tuk at least once just for the experience! But it’s not for the faint hearted as they are known for their notorious driving. And mentioned in our Bangkok Travel Guide, be sure to negotiate the fare before getting into the tuk-tuk. Our piece of advice is to only take the tuk-tuk for short distances. For a short distance, a tuk-tuk ride shouldn’t cost you more than about 70 or 80 baht. Though it may look cheaper, many times, taking a tuk-tuk for longer distances may actually come out to cost more than a taxi or car! 15. About Food and Sugar! We absolutely love Thai food! But there is sugar in pretty much everything there! Even Pad Thai has sugar. We are normally on a low sugar or processed sugar-free diet, so it took us a day of literally avoiding everything before we decided to throw in the towel and just take a break from your sugar-free diet. It was a great decision and worth the sugar for the amazing Thai food. This is especially true for street food desserts. 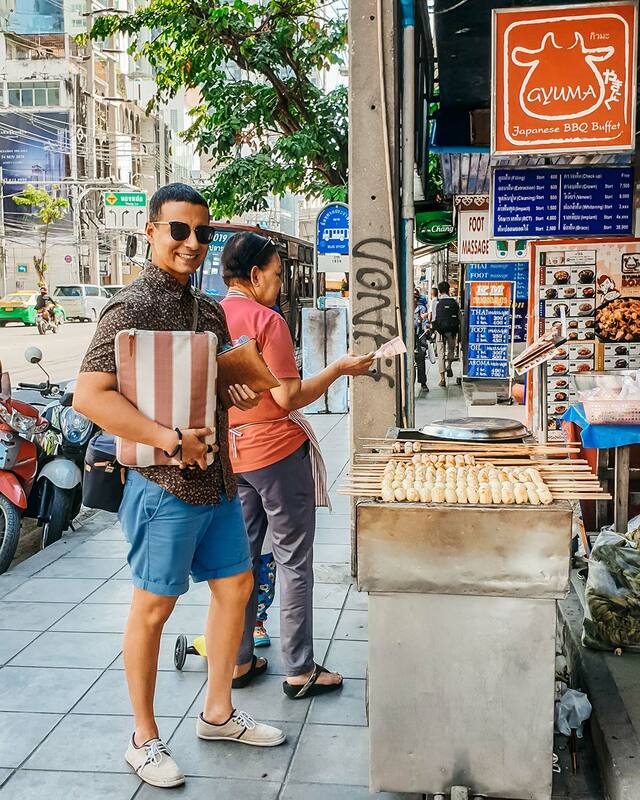 We can’t tell you the number of times we got something – street side grilled bananas or mango sticky rice – and didn’t get more because we thought we would come back. Never happened! Till today, we’re still thinking about the grilled bananas we got from Thonglor. Keep small change with you. This is our general rule of thumb when we travel anywhere, but in Bangkok, we found it was especially helpful. Mainly for when you’ve bargained something down to the price you’re happy with and the shop says they don’t have enough change for a big bill. You will be left to decide if you want the item, pay higher for it, or go around getting change and coming back (if you can find the place again). Same goes for taxis and tuk-tuks. Also, when you break a 1,000 Baht bill for a small amount, you have to worry about counting that you got the right change back. Again, this is something we do everywhere we go but is especially perfect for Thailand. Pack a big scarf or shawl that is not sheer and matches the outfits you’re packing. Pop the shawl in your daypack. It will come in handy when you visit temples and need to cover your shoulders and knees. So you won’t be forced to rent or buy an overpriced shawl if you need to cover up at the temple. It’s also great for when you go indoors with the freezing air conditioning. I usually pack a Turkish towel or Kenyan Kokoy, which doubles up as a towel if I happen to need one. Traffic is crazy and with the scooter, tuk-tuk and water taxi rides you may be taking, it’s best to know your options ahead of time. Be sure to check your travel insurance details (or buy travel insurance) prior to your trip so that you’re well aware of all the options available to you. We’ve detailed more on safety and medical facilities in Thailand in our article Bangkok Travel Guide for First-Timers. Petty crime, pickpocketing (even in temples) and theft does happen in Bangkok. Apparently, passport and credit card theft are relatively common problems in Thailand. As we do whenever we travel anywhere, we suggest to always upload soft copies of your passport, insurance and visas into the cloud as well as with your emergency contact and travel partner if you’re traveling with someone. Keep your credit cards, money, passport in separate places when you go out as well as in your hotel if there isn’t a safe available. 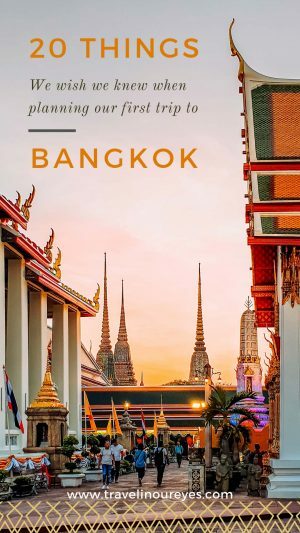 We hope these 20 things we wish we knew before traveling to Bangkok help you to get ready for your trip to Bangkok. 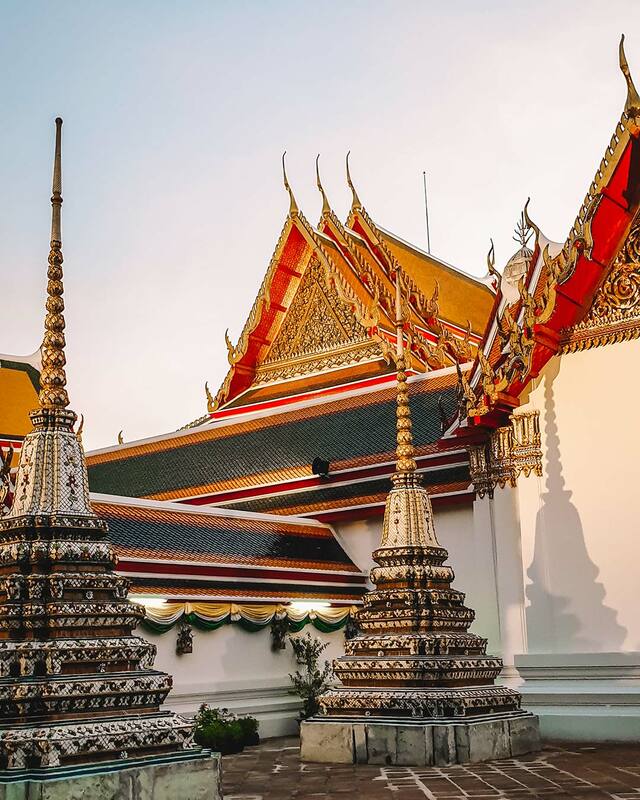 And even if you don’t have time (or energy) to go through all, just have a look at the first 8 things when planning your trip to Bangkok and we guarantee you’ll have a much more enjoyable, less stressful time in this super fun crazy city! 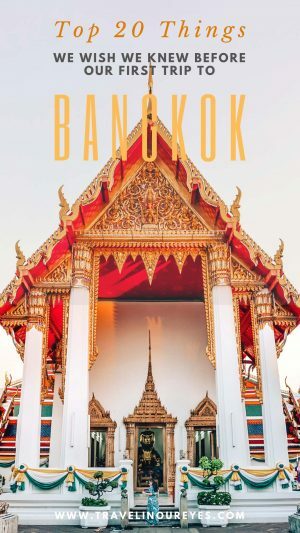 If it’s your first time visiting the city, check out our blog Bangkok Travel Guide for First-Timers for all you need to know about Bangkok. Wishing you great city getaways!